In 2012 voters passed Proposition 30—an initiative to raise taxes and take state government finances out of crisis mode. However, the new taxes, primarily falling on the top income earners in California, did not purport to be a cure for the underlying problem. Rather, the rationale was to give the state some breathing room. And Prop 30 came with an expiration date, 2018. Unfortunately, economics and the available empirical evidence suggest there is a very large risk that Prop 30 will produce the exact opposite outcome from that suggested by Kaufman. There are two issues that voters must consider before deciding whether to accept this risk. The first is the difference in incentives between a temporary and a permanent increase in income taxes. The second is the different impact a tax may have at different points in the business cycle. At the time, opponents warned of a mass exodus of high-income earners from the state were Prop 30 to be enacted, since the income tax hikes were restricted to those who earned at least $250,000 a year. California has become increasingly dependent on such high-income earners for tax revenues. Income taxes paid by the top 1 percent of income earners grew from 33 percent of the total in 1994 to over 50 percent in 2012, the first year of the Prop 30 tax surcharges. But the exodus did not happen. Most high-earners stayed, more came, and they and the Golden State have prospered. Why were the doomsayers wrong? It’s not easy to say. There are no data on this; nor are there data on the difference between a temporary Prop 30-like tax increase and a permanent one. However, we do know that people react differently when presented with the same policy if they think there is a crisis (let’s all pitch in and solve this) or if they think it is business as usual (why am I contributing this amount?). These questions of context and timing must inform how we think about extending Prop 30. For example, will there be a significant move of Californians to Seattle—where there are no income taxes—if Prop 30 income tax surcharges are made effectively permanent? If the answer is yes, then it could well be the case that state tax revenues would decline as high-income earners and their employees depart, offsetting gains from the higher taxes on those who stay put. This is a difficult but essential forecasting problem facing the voters as they consider the extension of Prop 30. Another forecasting problem involves the fact that income taxes apply to earned income, and in a recession income declines. A recession is coming. When? We do not know, but it is coming and tax revenues will necessarily decline when that occurs. Importantly, when it does, California’s high-income earners will once again take a greater hit to their income than the balance of the state. The heavier the reliance on them to fund state government, the greater the cuts will be to the same programs that Kaufman cited. But then shouldn’t the state extend Prop 30 income taxes to cover this impending shortfall? The unfortunate answer is no. Income that does not exist because of a recession yields the same revenue regardless of the marginal tax rate—zero. In fact, an extension of Prop 30 could make the situation worse than it was during the Schwarzenegger and Davis budget crises. Our current greater dependence on high-income earners to balance the state budget makes us more not less vulnerable. 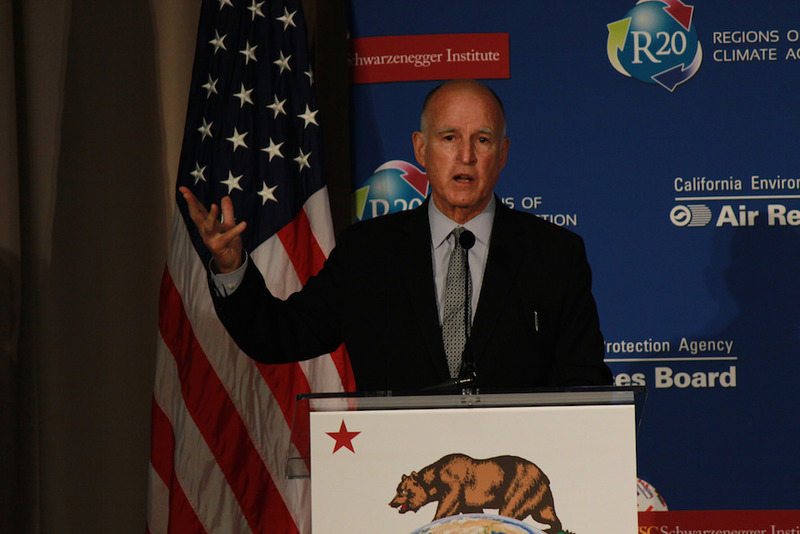 It is one key reason why the three bond rating agencies, Fitch, S&P, and Moody’s, rate California bonds as relatively high-risk investments compared to those of other states. The close and deleterious relationship between the unstable incomes of high-income earners and California’s public finances dates back to Governor Ronald Reagan’s progressive tax law, which itself was supposed to be temporary. Ever since then, when rich people have done badly, so has the state. The impact was not pronounced in the early years (1967 through 1990) because the California economy was dominated by large manufacturing firms, which paid middle-class wages to their workers. As innovation, technology, and their concomitant entrepreneurial activity replaced large-scale manufacturing, the importance of high-income earners soared. The income of the new entrepreneurial class is quite different than their high-income predecessors. In good times, these entrepreneurs and their team rake in profits. Their companies issue IPOs, they exercise stock options, and they receive generous bonuses. But when the economy tanks, so do their incomes. It is just not the same as, for example, a 15 percent reduction in the workforce at the GM plant in Van Nuys hitting revenues. It is a virtual wipeout of a major source of revenue. And so actual deficits—that is, an excess of general fund spending over general fund revenues (not counting savings from previous years)—have, even adjusting for inflation, grown dramatically. There is nothing in the revenue structure to suggest today is any different from the recent past. One counterargument is that the state now has a “rainy day” fund thanks to Prop 2, approved by voters in 2014. The current budget projects between $3 billion and $4 billion in the rainy day fund at the end of the fiscal year. It cannot be more because of Prop 98’s education-funding requirements and because of budgets that dedicate some of the increased income to restoring expenditures cut at the time of the previous recession. 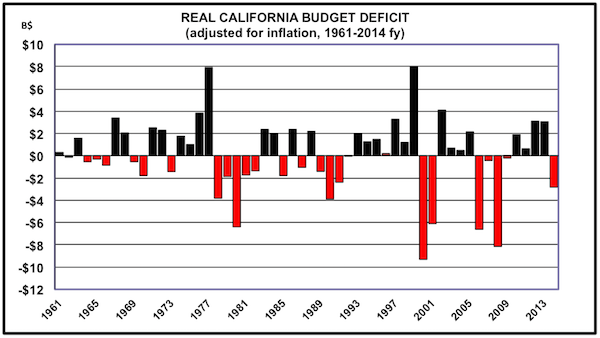 The important question then becomes: When compared to previous deficits, is this rainy day fund sufficient? A dispassionate reading would suggest it is not even close. Do we remember the $26 billion deficit of 2009? One estimate, using data from the 1991 recession, found that states need rainy day funds equal to about one-third of their budgets. For California, that would mean a rainy day fund of roughly $40 billion—10 times as large as today’s rainy day fund. A much milder recession than the last one, with heavier reliance on high-income earners, wipes the rainy day fund out and then some. There are two questions any discussion of an extension to Prop 30 must address. First, will permanent increases in taxes on entrepreneurs, the source of California’s rapid recovery from the last recession, leave the state bereft of many of them for the next recovery? Second, will increasing volatility in state tax revenues over the business cycle be a harbinger of what will happen in the next recession? I would suggest that the answer to both questions is yes and the initiative to extend Prop 30 taxes, rather than solving a problem, creates a worse one. A better alternative would be to change the tax system such that it generates a smoother revenue stream available to the general fund over the business cycle and prevents the kinds of drastic cuts we have become accustomed to. There are many ways of doing this that preserve progressivity in the tax structure, but the extension of Prop 30 is not one of them. Jerry Nickelsburg is adjunct professor of economics at the UCLA Anderson School of Management, and senior economist for the UCLA Anderson Forecast. *Photo courtesy of California Air Resources Board.